FlyingFiber’s SFP+-10GBASE-T Copper Small Form Pluggable (SFP) transceivers are based on the SFP Multi Source Agreement (MSA) . 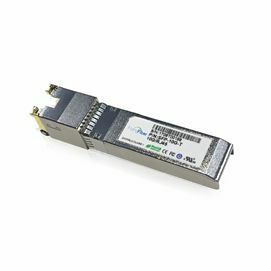 They are compatible with the 10Gbase-T / 5Gbase-T / 2.5Gbase-T / 1000base-T standards as specified in IEEE Std 802.3 . SFP+-10GBASE-T uses the SFP’s RX_LOS pin for link indication. If pull up SFP’s TX_DISABLE pin, PHY IC be reset.